Midfielder Cole Skuse has thanked the medical staff who attended to him following his clash of heads in the East Anglian derby against Norwich City, fans of both clubs for the ovation he received as he left the field and also the Canaries for sending him a get well soon message. 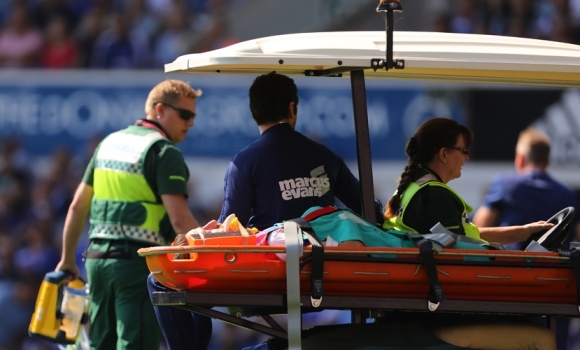 Skuse underwent a lengthy spell of treatment on the pitch just before half-time after clashing heads with Norwich defender Timm Klose at a Town corner. He was eventually stretchered off but was able to be driven home after the match. “I was out for the count for 90 seconds, two minutes but in terms of memory loss, there has not been a problem. I can remember it all,” he told the club site. “I’d like to thank everyone for the help on the day. At the time, I said a few foul words to the ambulance team out of probably being a bit giddy; there was frustration there as well because they were strapping me in from top to bottom - which I didn’t think was necessary. “They explained to me that it was as a precaution and they had to do it. Everything was done in the right manner. All the checks were done and that is why I was allowed to return to training pretty quickly. “As I was going off I could clearly hear the chants from the fans and the ovation I got from all areas, not just our fans, meant a lot to me. Peace has broke out. no problems at the match and now this. Long may it continue. But game up the road will still be a lunch time kick off on a Sunday, and as they want to stop people drinking before the match 5hey will let pubs open at 6am like they did in Ipswich. Yeah. They showed some class with their applause for Skuse as he left the field. It goes to show that the old folk of Essex, Suffolk, Norfolk, Cambridgeshire and possibly Hertfordshire aren’t a bad old bunch really. Rivalry is good, but sometimes you get a few muppets of days gone past. Let’s hope this is the start of how it should be and set the standards to where other teams rivals let themselves down. I remember when I was a kid in the 60's when you used to all stand together on the terraces. Rivalry was there of course but you wished no harm to anyone. I still feel the same, why the hell can't everybody else. Congratulations NCFC for there behaviour at the match and for the the applause and good wishes for Cole Skuse. Glad Skuse has made a good recovery. Well done you Norwich Supporters and Norwich City Football Club, I am very happy to read this and sincerely hope that all Supporters from both our clubs will adopt this sensible and caring attitude to one another always.in future, we only have one life, why spend it hating one another, thank you again Norwich. Yep got to give it to them, nice touch, maybe we could have friendly derbys like the Scousers? Well done Norwich City ! It was a pretty scary moment. Glad he's ok. Nice touch from Norwich. Glad that Skues had no adverse events from his injury, and a big thankyou to the good well wishes from Norwich City. Both Ipswich and Norwich, plus Colchester are fighting our cause for the true East Anglia in a very competitive football environment, we all wish our team to be the best in games against each other, but should always wish each other well against other teams? I've said this before but I grew up in an era when many fans supported both Norwich and Ipswich (as did I). Perfectly normal when I was a kid to stand on the terraces together cheering. Can't put my finger on when things changed so dramatically, but seems over the course of a decade that we somehow went from "friendly rivals" to "hostile enemies". For people in my generation it's just odd, as that isn't how we were brought up to support. I don't know how many of you remember this, but our main rivals at one point were Leyton Orient. Some of their older fans still regard us as their main rivals even today. Why? No idea. Nice touch from our neighbours up the road, Glad that Skuse is ok head injuries are worrying too say the least. I only bother delving into their forums prior to a derby match but i do sense the hatred is felt far more from their side of the border than ours. Just my opinion of course. Letter from their club to Skuse a nice touch as everyone alludes to however. I know we have not beaten Norwich for a long while now but i really do get more satisfaction from beating the likes of Leeds and Millwall whose fans have been dreadful to attend matches with for decades. If I'd been born and bred in Norfolk, I'd be a Norwich fan. I was born and bred in Suffolk, so I grew up following town. It's simple - rivalry is fun and an essential part of football. Alpha-male aggro is pathetic. I even started to doubt whether Delia really does take it up the....Well done Norwich. Glad Skuse is fine and should play this weekend! Well done for Norwich and their fans, a nice touch! Credit where its due and that was a nice gesture from our rivals - well done. Good gesture from Norwich City and well done to their fans for clapping him off. As much as I'd love to see us beat Norwich after so long I should add I know a lot of their fans (as I live in their neck of the woods) and most of them are fine. Have some really good banter with them in fact. Really nice touch from their fans and if the same or similar unfortunate thing was to happen to any of their players during a future derby match then we should of course extend the same courtesy to them. Shame it takes something like a serious injury to put things into perspective for the fans of two rival football clubs to come together more. Long may it continue - the peace, not the injuries! Is it safe to come out of the woodwork now and own up to going to all the ITFC home games in my teens with my dad; and about ten games at Norwich. Is is also safe to say I was at the Milk Cup final and also know the words to On The Ball City (perhaps better than they know it themselves).